No specifics, but I plan on releasing different, smaller scripts (add-ons) that simply add more graphical customization, much like the compact or ring options for the original VX script. Also here is the Compact Addon. This script requires PAC Main Menu Ace to work. 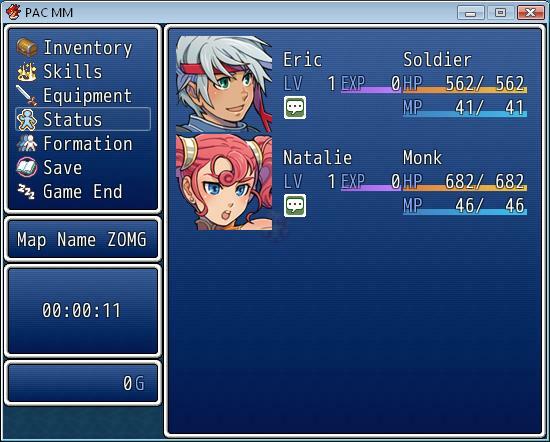 This is a graphical change to the menu, "compacting" the menu screen to only display the status window when required. The extra windows (the gold, map and playtime windows) can now by closed by pressing a designated button. Easily customize and move about the commands in the menu. You can even create your own! You can rename commands, change what they do (why would you want to though), and change the conditions required to use it. Icons for commands are now implemented in the menu. Optional, naturally. An EXP gauge is included in the actors' window. It may look out of place, but I wasn't sure where else to put it. It is, of course, optional. 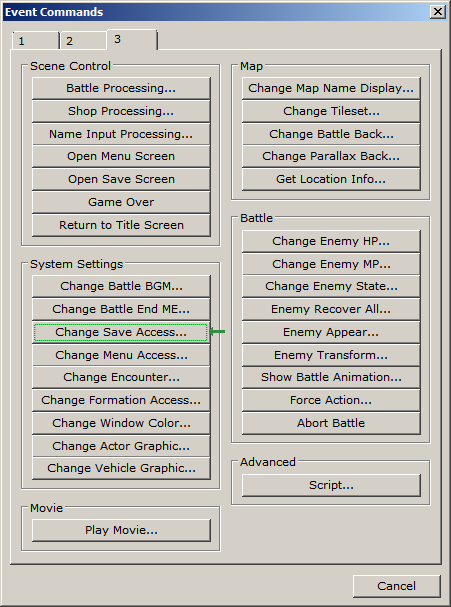 A map name window and a playtime window are included in the script. They are completely optional. As is the gold window now. The menu now remembers which command you were last on at all times, even after saving. The menu now immediately goes to actor selection if the command you just came from required actor selection. You can assign a button to heal the party when it is pressed in the menu during test play. You can choose to have the side windows on the left or right. Changeable height of the time window. "Compacted" command window with extra windows above and below it. Actor status window only appears when absolutely necessary (commands that require selection). Command window now in the centre of the screen. All the windows slide to the side for actor selection. Open and close the extra windows with the touch of a button. The menu remembers if the windows were open at all times, even after saving. Here we see the menu being AWESOME. Here is the Compact Addon in action. Paste above Main, below Materials. For best compatibility put it at the top of your custom scripts list. There are detailed configuration instructions in the script header. If you have any inquiries, please ask me. If you want to use the Compact Addon, paste the addon immediately below the base script. Want to be thanked? Suggest something, I might do it, put your name here and you might get a warm fuzzy feeling! Just post here. This script can be very complicated, so please do not hesitate to ask questions. If you expect this to work with another menu system, please don't expect that. I don't think it's very necessary. There are no in-game options, and the script itself is a demo. My favourite note this week is the D above middle C (293.665 Hz), and my favourite synthetic tone is a sine wave. You may use this script in any non-commercial project with credit. Contact me if you wish to use this in a commercial project. You may edit this script and use it in your own project, or even release it as your own script, as long as I am credited (being notified would also be nice). Updated to include more arbitrary and ultimately superficial features. Hey weren't you going to put my one actor menu in this? Again, there are some things that don't need to be there, and some things that could've been aliased, but a good job nonetheless. Would you mind if I included this design in PAC MM? You would, of course, be credited. I guess I just never got around to it. But that's a VX script anyway. Yeah, that's been fixed (it's also changeable so you can have as monstrously ugly and large as you want). I really should update the screenshot. Well, at least he said "please". Yeah, too bad he isn't on IRC. Why are you throwing a bunch of Menus scripts together and expecting them to work? Oh, thanks for the answer! But is there a way I can make the player able to save only at certain maps? Oh. 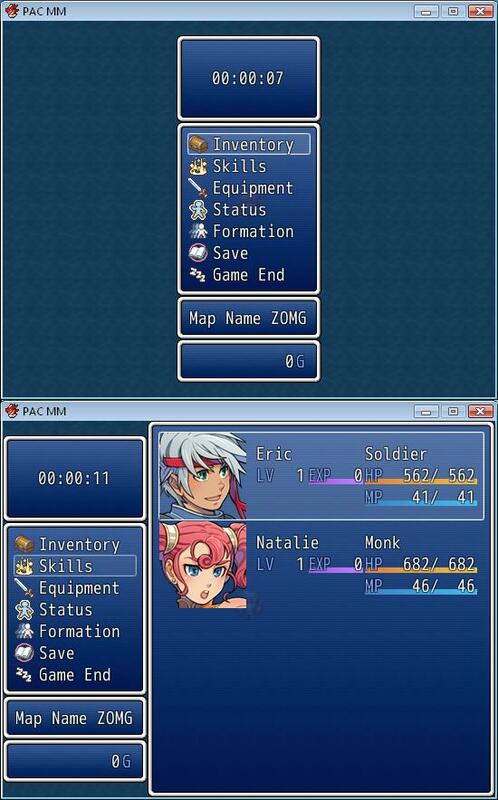 RPG maker has that function built into it. Yeah.. well actually that function doesn't work with the script. I'll take a look and see what I can come up with.